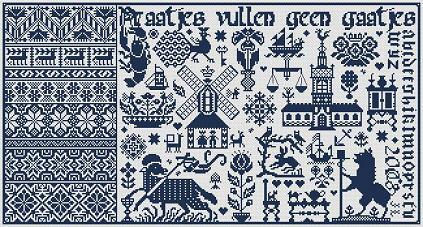 Words Alone is typical of a 17th century Dutch sampler. During this period it was common for samplers to include a band of patterns at one side. The phrase “praatjes vullen geen gaatjes” translates as “words alone come to nothing”. All the symbols have specific meanings: windmill with figures – peace, equilibrium and a happy marriage, church – belief in the existence of God, anchor – fidelity and hope, cat – liberty, peacock – life eternal, key – prosperity.